After three years of the very popular P-115, Yamaha returned with its newest model, P-125 which guarantees a completely magical playing experience for the pianists! With Yamaha P125, the digital pianos have been redefined. There are numerous features due to which P-125 has replaced P-115. The design of this piano is compact which makes it super convenient for the pianists to carry it around. Along with being compact and portable, the design is amazingly user-friendly. To summarize it all, this piano is one of the best portable digital pianos by Yamaha so far. No matter where you go, P-125 is always ready to help you put up a jaw-dropping performance for your audience. 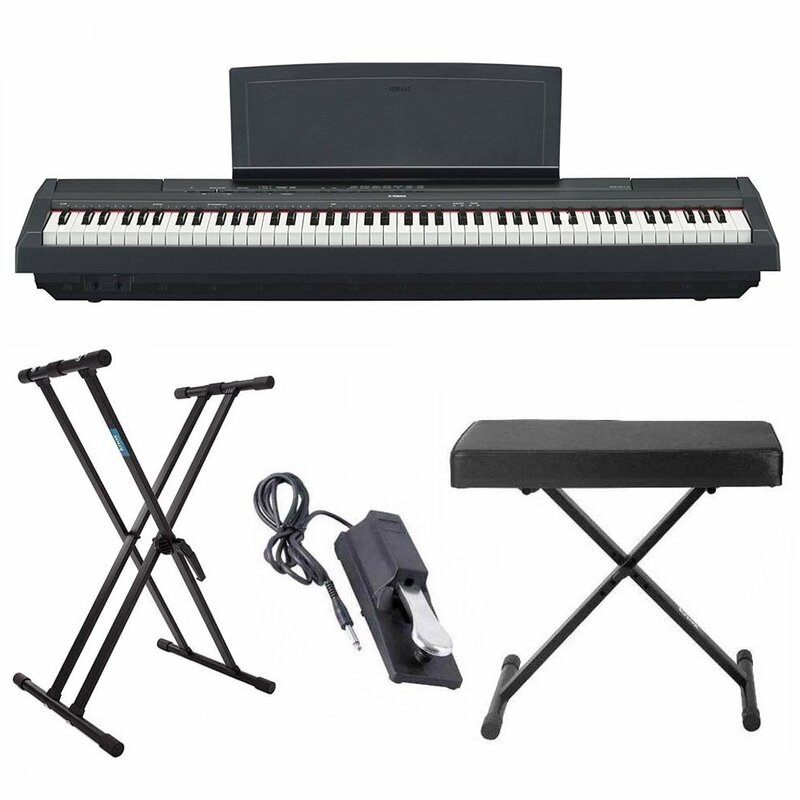 It is a simple piano model by Yamaha that surpasses the quality of all older portable digital pianos such as P-115. You can even go through the functions of digital piano for a comparison to see how amazing the features of P-125 are. The design is perfectly user-friendly as it has been designed to provide a pianist with a chance to perform exceptionally well. Simplicity is the major highlight of this model and the build quality, like always, is flawless. Lightweight and compact build are the qualities that make this model the perfect choice to play in a room or in front of an audience. Both the black and the white P-125 models have been finished with a red felt ribbon. The furniture style stand and the triple pedal unit are not included in the package but these are available as accessories. The total weight of the design in 26 pounds. The keyboard of the piano is the most important part as it is what helps a pianist put up a performance. The piano keyboard of P-125 is the Graded Hammer Standard (GHS) 88-key, which is the best feature for producing a sound like that of an acoustic piano. P-115 used the same keyboard so there is not much difference. This keyboard provides the pianist a lighter touch in the high-end while producing a heavier touch at low-end. Also, the keys of P-125 are touch-sensitive. The sound will change depending upon how hard you press the keys, although this can be prevented by choosing the “Fixed” option from the four touch sensitivity options available; Hard, Medium, Soft, Fixed. The sound produced by P-125 is similar to the sound produced by Yamaha CFIIIS 9′ concert grand piano, which is one of the most popular piano models by Yamaha. This is due to the fact that P-125 uses Pure CF Sound Engine. This model makes use of 4-layers sampling which encourages a smooth transition between the samples. The speaker system in P-125 is a 2-way speaker system. This speaker system allows the pianist to produce an expansive piano sound in upward as well as the downward directions. This is what gives P-125 the feature of acoustic sound. There is a limited choice of sound effects as Reverb is the only option that P-125 offers, although the range of this can be varied from 0 to 20 and four types of reverbs are available such as Recital Hall, Concert Hall, Chamber, and Club. Smart Pianist app: Yamaha P-125 is compatible with the smart-pianist app by Yamaha, which, for the time-being only work with iOS. As P-125 can now be connected with the smart-pianist app, the sound can be selected, layered and then split with the aid of an extensively user-friendly interface, in addition to this, the pianists can now choose the song from the play-lists in the phone. Bass and Drum tracks: P-125 provides some bass and drum tracks. They are pre-installed in the system through which a pianist can follow the harmony and keep playing in time. Also, there are some amazing rhythm patterns to choose from such as ballads, pop or rock, making piano practicing fun. New “Table EQ” feature: As this piano does not come with a furniture stand, it can be kept on any desk or table. There is a feature of “Table EQ” that helps a pianist play the keyboard while placing it on the table. With this feature, the sound coming from the internal speakers is optimized to get the best possible sound. P-125 is the new portable model for the pianists that has come with some upgraded features as compared to the P-115. Speaker System: the speaker system has been redesigned. There are four speakers on the instrument which is uncommon in digital pianos. This improved system of speakers produces crystal clear high frequencies. New Tones and Rhythms: as compared to P-115, there are additional 10 tones added to P-125. The newly added tones include cool electric pianos, organs, and strings. Also, six more rhythms have been added with the Bass part. Smart-Pianist App: unlike P-115, P-125 is a portable piano model that is compatible with the smart-pianist app, allowing the pianists to do a lot more stuff. Piano Sound: instead of 3 in P-115, P-125 has four layer sampling which makes the transition smoother. Table EQ: Unlike P-115, P-125 is way more portable as it can be played while keeping the instrument on the table as the table EQ feature optimizes the sound coming from the internal speakers. New Stereophonic Optimizer feature: This feature allows the pianist to play with their headphones on and with a great variety of headphones available; they will enjoy a phenomenal playing experience. Improved speaker system providing an out of the world playing experience. Compatible with the smart-pianist app. Can be used at homes and even in front of the audience. Pure CF sampling with 4 layers. Yamaha’s P-125 has come to the markets with super cool upgrades. Even though not much has been changed in regards to the sound, but the additional features have grabbed the attention of many pianists from all around the world. This is an amazing piano for people who wish to help their kids learn to play piano due to its simple design and functioning. 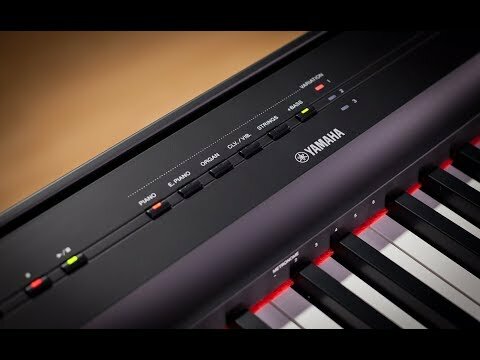 There is still some room for improvement in regards to the sound as the GHS keyboard action has been running for quite a while now, it is time that Yamaha comes with newer ones to stay in the game.